Agmatine, also known as (4-aminobutyl)guanidine, is a derivative of the amino acid l-arginine. Stored in neurons, this compound (also referred to as "super arginine") is known to assist with central nervous system function, primarily as a neuromodulator and neurotransmitter. Research into agmatine reveals a potential to improve the symptoms related to neuropathic pain, and the ability to assist with the treatment of drug addiction. Agmatine also helps to govern nitric oxide (NO) synthesis, as well as working to properly regulate cellular energy by overseeing polyamine metabolic function. This makes agmatine sulfate a popular pump-inducing supplement choice. For best results, do not take agmatine along with protein. Dietary protein can slow the absorption of agmatine, and because of this diminish the benefits of this supplement. Agmatine is typically listed on supplement labels as agmatine sulfate. Dosages range between 250 mg to 1,000 mg per scoop, with intake recommendations hovering between 1 to 2 grams per day. It should be noted that these products are usually focused on pump inducement and the muscle building process, so daily dosage recommendations may vary slightly compared to nootropic recommendations for mental clarity, stress reduction, etc. Ethitech Nutrition Agmatine - Mix one serving (1g/1000mgs) into 8oz of water. Consume 1 serving prior to training and at any time(s) on non-training days. RSP Nutrition Agmatine Sulfate - Take 1 scoop (500 mgs) with 4-6oz of water 20 mins before training or stack with your favorite pre-workout. For best results take an additional scoop during training. 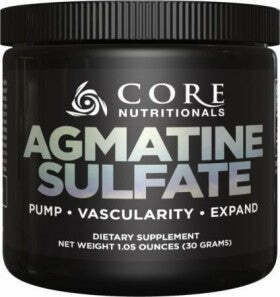 Core Nutritionals Agmatine Sulfate - Take 1-3 scoops (500-1500 mg) per day with food. For best results, take 30-60 minutes before your workout. It should be noted that while stand-alone agmatine sulfate products are popular, agmatine is also found in pre-workout and nootropic supplement blends, as well as in Machine Fuel BCAAs by MTS Nutrition. So to recap, when used as a muscle pump-inducer, 500 to 1,000 mgs of agmatine sulfate should be taken 20-30 minutes prior to training. An optional 500 to 1,000 mgs may also be taken during training. Agmatine can be taken at any convenient time on non-training days. It bears repeating that agmatine provides a strong dual-pronged attack. Not only does it function as a nootropic, working to improve mental clarity, lower stress levels, and increase focus and well-being, but it also assists with muscle pumps and insulin regulation which can only aid the muscle building process. This section will look at the major potential benefits of agmatine supplementation. Benefit - Potential for improved quality of training, better focus, and a reduction in perceived pain, including pain derived from inflammation. Benefit - An increase in insulin response lends itself to a leaner, more muscular physique. Benefit - Improved focus, better overall health and sense of well-being, and a more relaxed state. Benefit - Potential for improved state of well-being and lower anxiety levels. This can also assist with maintaining the motivation to pursue better health and fitness. Benefit - Agmatine can improve vasodilation, leading to improved nutrient delivery to muscle cells, and an increase in muscle protein synthesis rates which impact the muscle building process. Benefit - A healthier blood pressure allows for improved nutrient delivery, improving overall health and lending itself to a more optimal muscle building/recovery process. Agmatine shows promise as a stroke-related neuroprotector when used during pretreatment. Simply stated, individuals who feel they are at risk of a stroke may benefit from agmatine supplementation if/when a stroke does occur. Benefit - Agmatine supplementation has the potential to reduce neuro-damage caused by a stroke. Agmatine has been show to improve appetite after reaching the point of satiety. During some studies, food consumption was increased by rates upwards of 44 to 54% over a 24 hour period. Agmatine works in an opposite manner compared to yohimbine, which has been shown to suppress the appetite. Benefit - Hardgainers, or individuals who have a more difficult time gaining weight, may benefit from agmatine supplementation. They are likely to eat more, even when full. Agmatine supplementation may lead to the increased secretion of luteinizing hormone, though this effect appears to be dose dependent. Luteinizing hormone plays a vital role in male testosterone production. Benefit - Bolstered testosterone production yields a myriad of health benefits, including the ability to impact muscle tissue growth and maintenance. Agmatine supplementation may lead to the increased secretion of luteinizing hormone. Luteinizing hormone plays a vital role in male testosterone production. The following side effects have been associated with agmatine supplementation. Increased appetite. Increased appetite, even when full. This makes agmatine a better overall choice when bulking or trying to gain weight, and a supplement that could potentially increase appetite during fat loss diets. Minor potential for gastrointestinal discomfort. Though agmatine has been shown to bolster gastrointestinal health , a very small percentage of individuals may experience minor gastrointestinal discomfort and nausea when supplementing on a daily basis. It should be noted that these side effects were noted on individuals supplementing with 3.5 grams of agmatine per day, over the course of a 3 week period. Limited testing at high dosages. There is limited research studying agmatine dosages above 2,600 mg per day. Though all indications hint that agmatine is rather non-toxic, there is little reason to take dosages higher than this. Most scientifically-backed benefits are derived from dosages ranging between 500 to 2,600 mg per day. 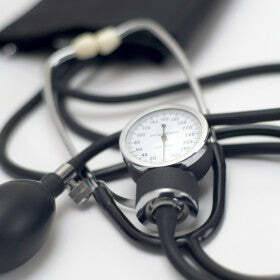 Lowering of blood pressure. Because agmatine can exert a widening of blood vessels, which is a desirable benefit for most individuals, the resulting potential for a minor blood pressure drop may be undesirable for persons who are currently being treated for low blood pressure (hypotension). Is agmatine found in any common foods? Because it is a bacterial byproduct, agmatine can be found in fermented foods such as wine, beer and even instant coffee. These concentrations are extremely minimal; significantly lower than the amounts found in agmatine supplements. Is arginine the same as agmatine? No. Agmatine is a derivative of l-arginine (a conditionally essential amino acid), but they do not share the exact same researched benefits. Though arginine is required by the body and supports many important functions, supplementing with arginine will not provide the same benefits as supplementing with agmatine. Arginine has the ability to convert directly into nitric oxide, but agmatine does not. Despite this difference, agmatine still has the ability to positively impact muscle pumps via other physiological mechanisms. How much agmatine can you take per day? While research reveals that agmatine is quite non-toxic, limited studies have been performed on humans using dosages above 2.6 grams per day. For this reason it's recommended that you avoid super-loading. Can agmatine help with alcohol withdrawal? Are there any supplements agmatine shouldn?t be combined with? There is research indicating that l-arginine, l-citrulline, yohimbine, D-aspartic acid and creatine may hinder agmatine absorption or effectiveness. For this reason it's recommend that you avoid taking agmatine at the same time as these other supplements. Can you stack agmatine with any other supplements to increase benefits? It may be beneficial to stack agmatine with a growth hormone supplement to provide improved ergogenic enhancement in the form of better recovery, performance or stamina. Agmatine can also be taken with carbohydrates to help provide a glycogen resynthesis boost.